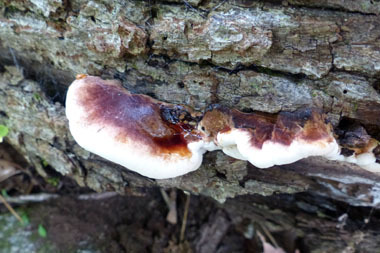 Overview: This fungi occurs singly or in groups on fallen hardwood tree trunks and branches sometimes in overlapping clusters. 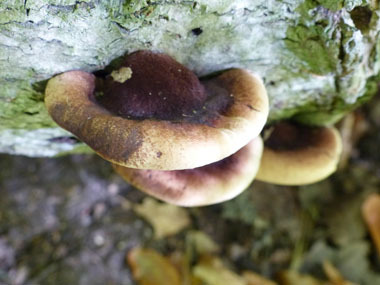 It causes a white to yellow rot of the trees that separates the annual rings in the wood and often smells like anise. They can fruit until the first hard freeze. Distinguishing Features: This fungi’s cap has a folded-over edge above a spreading pore surface making it look like mummified ears. 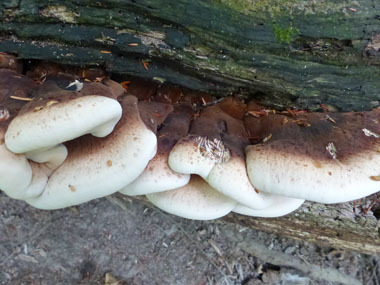 Late fall polypore are velvety to touch and sometimes they emit droplets of water, which ball up on top of the resinous surface like beads. 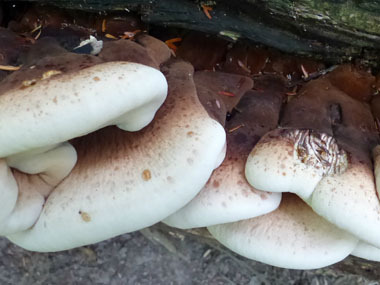 When young it is quite thick and fleshy, with a pale brownish surface and a thick white margin. In maturity they are dark brown, sometimes with zones of color, fairly smooth, dry, and tough. 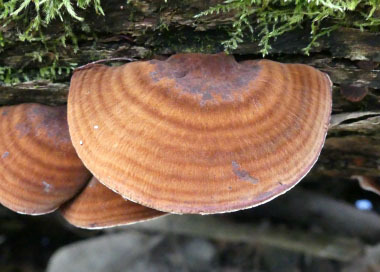 A tan to reddish brown resin often encrusts these fungi, whose interiors are white. There is no stem. Height: These do not have a stem to give it height but caps are up to 25 cm (10”) wide and 2.5 cm (1”) thick. 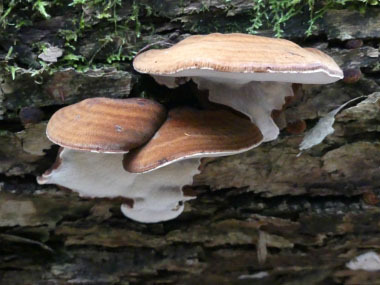 Habitat: Saprobic on the deadwood of conifers and hardwoods and conifers. Prefers both recently fallen wood and on old downed wood. 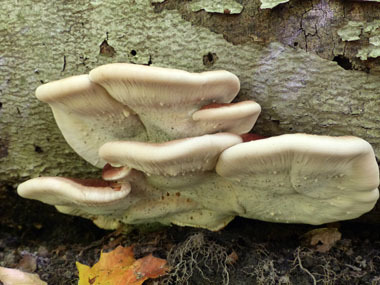 Edibility: This fungi is said to be edible when young due to high water content; although edible this is not necessarily palatable. They become cork-like with age and inedible. 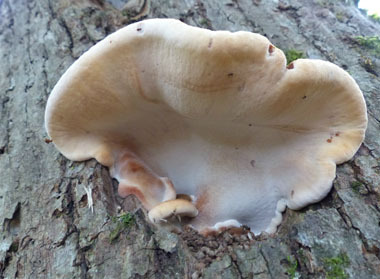 Other name: Late Fall Polypore.